Do you have trouble getting the low notes to come out on your saxophone sometimes, or ever? You’re not alone, this is something that every sax player struggles with at some point. In this lesson, I’m going to go over the most important things you need to be doing to get the low notes out on your horn. Watch my video below or read the rest of this post if you prefer. It all comes down to breathing and how you use your air. Once you learn how to use your air correctly, not only will you have more confidence and consistency with the low register, but your sound over the entire range will improve as well as your timing articulation, intonation, and just about everything else. First off, your sax needs to be in good working order. This means that all the pads need to be sealing well. If they’re not, you need to visit a repair technician and have your horn looked at. So assuming that your instrument is in good shape, the key to getting low notes out is all about how you use your air. We are going to focus on the low notes first, and then continue to breath in the same way across the entire range of the horn. We do this because it’s while attempting to play the low register of the saxophone that our bad breathing techniques get exposed. Your air is the energy that powers the saxophone. So Before you blame your mouthpiece or reed or instrument for a not so great sound, realize that without proper breathing technique you can’t sound good on any equipment. Also if you haven’t watched my embouchure tutorial video and my reed placement video check those out next. You need to be doing those things correctly as well for all this to work. Some of you may have been told or read somewhere that you need to breath from your diaphragm. This is true, but we are always using our diaphragm to breath all day long. So let’s dig a bit deeper into exactly what is happening in our bodies when we breathe while playing the saxophone or any wind instrument. When we inhale, we fill up our body’s air tank just like a balloon. You will see your chest and abdomen expand when you take a deep breath in. When we blow into the saxophone, we have to control the release of this air so that a somewhat consistent air pressure is maintained. 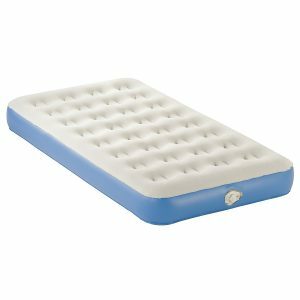 Picture an inflatable mattress. When we open the valve to release the air, at first it comes out fast, but the pressure reduces quickly as the mattress empties. We then have to squeeze the remaining air out. As wind instrument players, we need to use the muscles of our abdomen to push the air out more and more in order to maintain the air pressure as our balloon empties itself. The less air we have in the tank the more we have to push. The first thing you need to get used to doing is filling your air capacity completely with each breath. Most saxophone students are not doing this. When you breathe in, open your mouth so the air can come in quicker and make less noise. Don’t breathe through your nose. Quickly fill your air tank to maximum allowing your abdomen, then rib cage then upper chest to expand as you fill up. When you blow out don’t do it the way you blow out candles on a birthday cake. Instead blow out as though you are fogging up a mirror. This helps you do 2 important things automatically. It opens up the throat and lowers the tongue out of the way. This will give you a more open and round sound and makes a big difference for getting the low notes to come out. This helps to automatically regulate the controlled release of the air. Practice doing this on your hand with your embouchure set and notice the difference. It’s very important that you keep the air pressure consistent and strong when blowing into your horn. We want to avoid a big rush of air in the beginning followed by a weak air flow. The result of this is the all too common honking sound beginner saxophonists make. It helps me to have a mental picture of a balloon pressing up against the mouthpiece. That balloon is my air and my job is to keep it pressed against the mouthpiece at the same level of pressure throughout the exhalation. In order to practice all of this, you have to do long tones. This way you don’t have to think about anything else other than what you’re doing with your air. Then set your embouchure and blow as though fogging up a window. Maintain air pressure using the muscles in your abdomen to gradually squeeze the air out of your body. 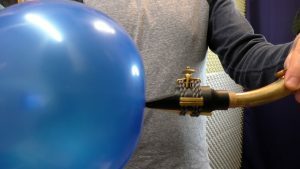 Visualize a balloon pressing up against the mouthpiece. Repeat this for each note descending chromatically down to Bb. If breathing in this way is totally new to you, it will take a while for you to develop these techniques into consistent habits that you will eventually do automatically whenever you play. I recommend you practice this using long tones daily and for the foreseeable future. Start with the lower register and then continue in the same way playing every note going up to the limit of your range. Pay careful attention to not allow yourself to fall back into poor breathing habits while you practice. You can then concentrate on applying these techniques to everything else you play. Your saxophone sound is a long term project. If you want to develop a beautiful sound, be prepared to put the necessary time in. Starting off with good habits and proper technique will go a very long way in getting you there quicker though. Please let me know your thoughts on this in the comments section below. Tell me if this technique has helped you have more success playing the low notes on your saxophone and if it’s helped to improve your sound and overall playing as well. If you have any questions about this topic the best place to ask is in the comments section below. Carlos, Great to hear, i’m glad. Thanks for the helpful videos. I’ve shown some of my older students your Embouchure video above, and some of my younger students the How to Play Low notes video above. Thanks for this lesson, it’s really helpful. I want to ask a question sir and is… Do I blow/pump out while blowing air into my horn? I’ve always noticed my abdomen always goes in and gets flatter while playing my horn. You want to allow your stomach and chest to expand when you inhale to get the maximum air capacity. As you push this air out with your diaphragm everything will contract and get smaller again. So many youtube videos now on all stuff related to music instruments, but I feel it destroys the feeling for music. Kids just learn the technique of playing, but they don`t feel it enough as they would by just listening. I don’t feel that information on the internet (as long as it’s truthful and accurate) destroys the feeling for kids. It actually inspires lots of kids to make music and allows them to hear lots of stuff they wouldn’t normally be exposed to. Listening is always the most important part of the musical learning experience, of course. Lucky for us there’s lots of music to listen to for free on the internet. Hi Jay, thanks for your helpful videos. I have a problem with breathing out! I have mastered breathing techniques for flute and singing, and teach my asthmatic patients how to breathe more effectively. Breathing in is not a problem. However, I find on sax I can play a long phrase and then my body needs oxygen, but my lungs are still half full, so I need to breathe out before refilling. This is a great question and topic for a YouTube video. I’m going to put it on my list. The trick is to first empty your lungs of air completely before inhaling. This is not a natural thing to do and takes a little bit of practice at first. You really want to be in the habit of pushing all the air out. It’s easier to explain in an actual demonstration though. You also want to avoid putting good air on top of bad. so always empty out before filling back up.